IL-17 is a T-cell-derived proinflammatory cytokine, which is suspected to be involved in the development of rheumatoid arthritis (RA) because this cytokine is found in sera and synovial tissues of RA patients. The pathogenic roles of IL-17 in the development of RA, however, still remain to be elucidated. To elucidate the roles of IL-17 in the development of arthritis, we produced IL-17-deficient (IL-17-/-) mice, and examined the effect of deficiency on the development of arthritis in two etiologically different, spontaneous RA models, the HTLV-I transgenic mouse model and the IL-1 receptor antagonist (IL-1Ra)-deficient mouse model, as well as the type II collagen-induced arthritis model . IL-17-/- mice were produced by replacing exon 1 and exon 2 of the il-17 gene with a neomycin resistance gene . HTLV-I transgenic mice carrying the HTLV-I env-pX region and IL-1Ra-/- mice were produced as described elsewhere [3, 4]. Both HTLV-I transgenic mice and IL-1Ra-/- mice develop arthritis spontaneously due to autoimmunity caused by excess T-cell activation. 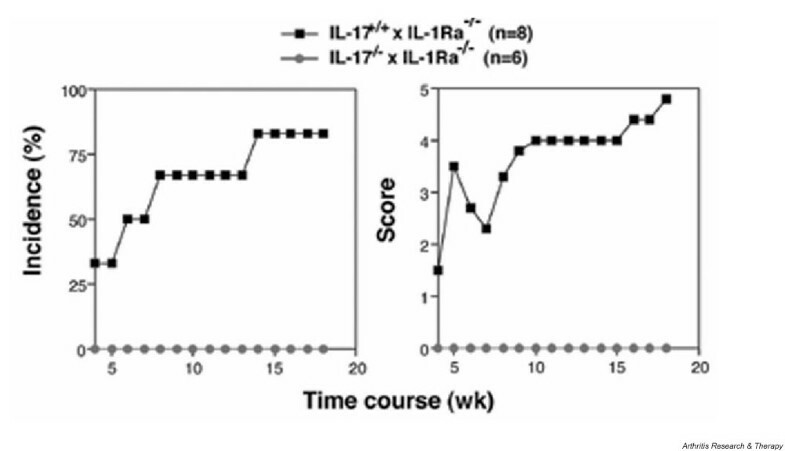 The development of arthritis in HTLV-I transgenic mice was markedly suppressed in IL-17-/- mice, and that in IL-1Ra-/- mice was abolished completely (Fig. 1). Development of arthritis in IL-1Ra-/- is completely suppressed by the deficiency of IL-17. Moreover, type II collagen-induced arthritis was markedly suppressed in IL-17-/- mice. We found that crosslinking of OX40 led to promote IL-17 production on CD4+ T cells, and OX40 expression was augmented in IL-1Ra-/- mice due to excess IL-1 signaling, resulting in the overproduction of IL-17. IL-17 was responsible for the priming of collagen-specific T cells and collagen-specific IgG2a production. These observations suggest that IL-17 acts downstream to IL-1, and plays a crucial role in the development of arthritis by activating autoantigen-specific cellular and humoral immune responses. This work was supported in part by a Grant-in-aid for Scientific Research on Priority Areas from MEXT, and the Ministry of Health, Labor and Welfare.